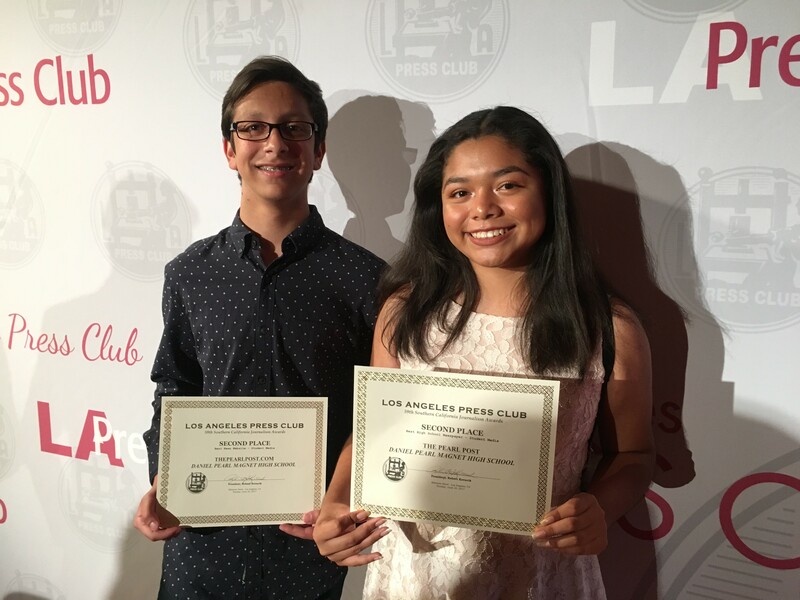 On June 25, The Pearl Post took home two second place awards at the 59th annual Los Angeles Press Club awards. The event took place at the Millennium Biltmore Hotel in downtown Los Angeles. The ceremony featured countless journalists and celebrities, including Los Angeles Press Club President Robert Kovacik, Spanish broadcaster of the Los Angeles Dodgers Jaime Jarrín, L.A. Mayor Eric Garcetti, Judea Pearl, Andrea Mitchell of NBC and MSNBC, and comedian Conan O’Brien. At the start of the event, attendees were allowed to take photos on the red carpet and soon after, the silent auction full of jewelry and signed memorabilia was open. As the program began, dinner was served at the same time Kovacik gave his opening speech. In a matter of moments, the student category awards in which The Pearl Post was nominated in came up. The newspaper placed second for the best High School Newspaper, coming in after The Accolade from Sunny Hills High School. The accompanying website, which was up against four universities, also won second place after the UCLA’s Daily Bruin. This has been the fifth year in a row in which The Pearl Post has been a finalist. President of the National Press Club Jeff Ballou spoke about the importance of journalism, emphasizing the significant role it plays in everybody’s lives. After another set of awards were handed, Judea Pearl introduced recipient of the Daniel Pearl Award, Daniel Berehulak. The photojournalist recently covered the massive drug war in the Philippines, earning him the award that stands for courage and integrity in the world of journalism. Pearl said that his son, Daniel, risked his life reporting to expose the truth and that Berehulak has also done just that. Jarrín later introduced his father, Jaime Sr., who was given the Bill Rosendahl Public Service Award for spending decades as a broadcaster for the Dodgers. Unlike many other sportscasters, Jarrín covered thousands of games for nearly six decades to the Spanish-speaking audience, making them feel welcomed into an event that is essential to American culture. The Press Club has also brought in a new award which was handed out for the first time this year. The Truthteller award was given to rapper Shawn “Jay-Z” Carter and producer Harvey Weinstein on their documentary covering the falsely imprisoned African-American man, Kalief Browder. Unfortunately, Carter and Weinstein were unable to attend the gala. Browder’s brother Akeem, however, accepted the award for Carter and Weinstein. Akeem also talked about running for mayor of New York City in hopes of changing the criminal system, mainly because his brother wasn’t sent to juvenile prison despite the fact that he was only 16 years old. O’Brien then gave a small speech about CNN anchor and Chief Washington Correspondent Jake Tapper. This led to Tapper accepting the award for his impact on the media. He has reported on many events, most prominently the 2016 Presidential Election. The final award was given out to NBC and MSNBC reporter Andrea Mitchell for her lifetime achievements in journalism. Mitchell was chosen for the Joseph M. Quinn Award because of her many journalistic achievements. She has reported on countless events such as the Watergate scandal and has made many contributions with her reporting. The hashtag #nottheenemy was used on social media to publicize the event. The tag is based on the recent bash on many media outlets in which, mainly Republicans and conservative-leaning news outlets, believe that the mainstream media is creating problems with false facts and reporting. Vice President of the LA Press Club Cher Calvin mentioned that the media is working for the better cause. She also advocated that people have to work together to show that the media is not the real enemy.